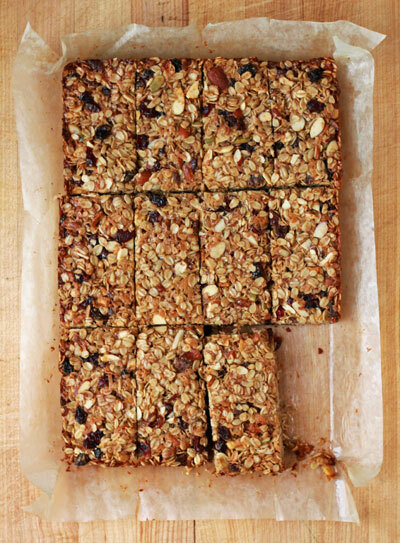 These sweet, satisfying granola bars (which just so happen to be vegan) are as good for breakfast as they are as a mid-afternoon snack. To make them gluten-free, be sure to use certified gluten-free oats. When testing the recipe, we used an inexpensive grocery-store brand trail mix containing cashews, sunflowers, walnuts, pepitas, cranberries, golden and Thompson raisins. If you use a trail mix containing chocolate or yogurt chips, be extra careful while baking, as the chips will melt. Preheat oven to 350° with a rack in the middle position. Line an oiled 13″ by 9″ pan with parchment and set aside. Mix oats, almonds, coconut, trail mix and dried berries in a large mixing bowl. Combine coconut oil, brown sugar, almond butter and brown rice syrup in a small saucepan over medium-low heat and stir until dissolved, 3–4 minutes. Stir in vanilla, salt, cinnamon and nutmeg and pour over oat mixture, tossing well to combine. Press the granola mixture evenly into prepared pan using a sheet of waxed paper or plastic wrap on surface and bake 20–25 minutes until lightly golden and fragrant. Remove from oven and allow granola to cool completely before cutting into 12 bars. Wrap bars in wax or parchment paper and store in an airtight container for up to three weeks.